They were popular cartoons in The New Yorker. And they found success on the big and small screens. Now a musical version of "The Addams Family," based on cartoonist Charles Addams' creepy characters, is planned for Broadway, aiming to arrive during the 2009-2010 season, producer Stuart Oken announced Monday. The show features music and lyrics by Andrew Lippa, who composed the score for the off-Broadway version of "The Wild Party," while Marshall Brickman and Rick Elice, who wrote "Jersey Boys," will provide the book. "The Addams Family" will be directed by Phelim McDermott and Julian Crouch, best known in New York for their work on the equally macabre "Shockheaded Peter." 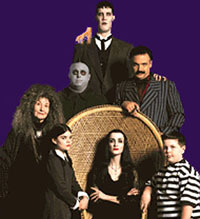 Among the ghoulish folks in Addams' menagerie are Gomez, Morticia, Uncle Fester, Wednesday, Pugsley and Lurch. A 1991 film version based on the characters starred Raul Julia and Anjelica Huston, while a mid-1960s television series featured John Astin and Carolyn Jones. Addams died in 1988. "The Addams Family" will be produced by Elephant Eye Theatrical, a company headed by Oken and Michael Leavitt.